Michigan State's Draymond Green is one of those basketball players that comes around every decade or so. He's a coach on the floor. He will address the team almost as much as head coach Tom Izzo will in huddles and during pre- and post-game talks. He's a 6-foot-7, 230-pound point forward that reminds those in East Lansing of a stud nicknamed "Magic." He can seemingly do everything. Well, everything except play well against bitter intra-state rival Michigan. Overall, his stats have increased each year in most categories (see table below). Yet, when it matters in the battle for state supremecy, Green seems to shrink. In six career games against Michigan, Green has scored a grand total of 37 points, grabbed 30 rebounds and dished out 19 assists. 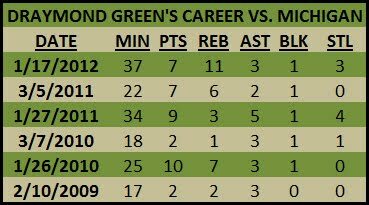 Green's averages in the rivalry games: 6.1 points, 5 rebounds, 3.1 assists. That's not terrible - for a role player. Now, one would argue that in Green's first two years - which resulted in a pair of Final Four appearances and a 3-0 record against the Wolverines - Green was more of a role player. He did play behind Goran Suton, Marquise Gray and Idong Ibok during Michigan's State's 2009 NCAA Runner-up season. The following year he was the team's sixth man, but still played behind then-fellow sophomore Delvon Roe. Nevertheless, the numbers haven't gotten better in the last two years. Despite averaging 31 minutes in those three games, Green hasn't scored in double figures. Worse for Spartan fans, Michigan has won the last three games against Michigan State for the first time since 1998. Michigan State fans always will be grateful for everything Green has done in East Lansing. There are two things he could do that would make him an unforgettable Spartan: Winning a national championship and having a monster game against Michigan. Obviously, Winning a national championship is the biggest goal for any player. (Note: Green initially committed to Kentucky when Billy Gillispie was the coach. Ironically, this year's Wildcats would have given him one of the best chances to achieve that national championship goal). And while all teams and players have that dream, I think even Green would acknowledge that reaching a Final Four this season - his third in four years at MSU - would be a phenomenal feat. But, having a monster game - say, 20 points and 10 rebounds - in the state showdown would be the final validation of a storied career. 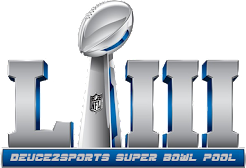 Three games stand between now and a date circled on Green's calendar: February 5, 2012. It's not circled because of Super Bowl XLVI, but because that'll likely be Green's last chance - barring a matchup in the Big Ten Tournament - of staring in the rivalry game. For the Spartans' MVP, I expect a MOP-type game against the Wolverines. Finally.